1.Remove the engine compartment cover. 2. Push the tab to remove the coupler. 4. 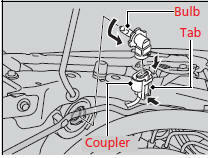 Insert a new bulb into the headlight assembly and turn it to the right.